The 2016 State of the Climate Report Presented to the United Nations Climate Conference in Morocco November 2016 gives an excellent and pithy summary on where things stand in regard to Global Warming and/or Climate Change and the manmade CO2 contribution, or non-contribution, to those important topics for anyone interested in the subject. Science is a wonderful thing. As time moves on, in a single direction, Science, as an endeavor, discovers new things and improves our lives. With a “hat tip” to the inestimable Jane Brody, health journalist at the NY Times who covers the story here, we are reminded of the study [free .pdf] from Antonio Gasparrini et al. which was published in The Lancet, July 25, 2015, with the [way too long] title: “Mortality risk attributable to high and low ambient temperature: a multicountry observational study”. Here is 38 years of empirical data clearly showing a relationship between the satellite temperature and the rate of change of atmospheric CO2 concentration at the Mauna Loa Observatory. There is a new post by Dr. Sebastian Lüning and Professor Fritz Vahrenholt, translated by Pierre Gosselin, on the effect of ocean cycles on 20th century warming and the 21st century pause. They had previously written about this in their popular book The Neglected Sun, in English here. Marcia Wyatt and Judith Curry have also written about the effect of ocean cycles here. These roughly 60 to 65-year cycles have the advantage of explaining the warming from about 1910 to 1944 and the warming from 1975 to 2005 with a similar mechanism. 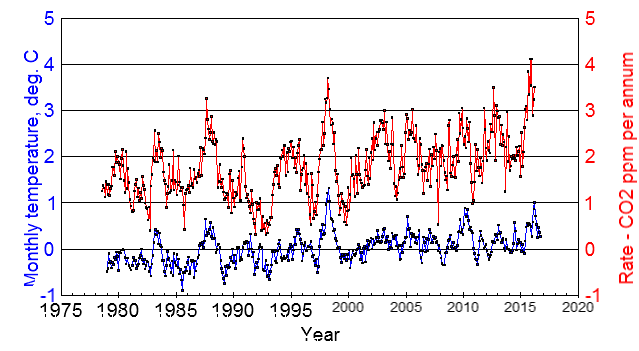 This is important, because the two warming events are very similar, as shown here and in figure 1.